Preparing your property for the snow and cold temperatures. Here are a few things you should do before Old Man winter sets in: inspect the roof for cracks, seal up any place where water may get in, remove all debris from the roof surface, clean out all gutter and down drains to prevent clogging and freeze up during the win­ter cold. The furnace should be cleaned and the filter changed: inspect all windows for heat loss; where the possibility exist that there may be heat loss, the use of a plastic window covering will inexpensively solve that problem. If you haven’t changed the battery in the smoke detector, now is the time to do so. Now kick back and enjoy the snow. At our November 2, 2013 breakfast forum, our Discussion leader. Jeffery Legette gives us a history of the Boys and girls club and expresses his deep love for what they do. The Boys & Girls Club of Chester has been a consistent source of opportunity, encouragement, and enjoyment for the children of Chester. One of the main focus points of The Boys & Girls Club of Chester is to supplement the formal school training with tutoring and mentoring. The Boys & Girls Club of Chester have a limited staff of trained and dedicated professionals with many years of service in the Chester Upland School District. The club operates on a relatively small budget while trying to fulfill the needs of Chester’s youth. Donna Northern give us a picture of how important financing is The present availability, and the future survival of The Boys & Girls Club of Chester is the development of a stable, reliable, and consistent funding stream for the present and budgeted expenses of the Club. We are constantly trying to be able to tap into the generosity of many major organizations and institutions. We hope to be able to capture and maintain the confidence of all those organizations who have recently helped or, who in the future, may want to help The Boys & Girls Club of Chester with outstanding caring and action. The ability of the Club is to generate a consistent, reliable funding stream for both operational expenses and capital projects that will determine just how well the Club will be able to fulfill its desired mission. We are a non-profit organization. At our September 7, 2013 breakfast forum, our Discussion leader Ed Coleman challenge us to search our minds for our definition of what we believe a true man to be. Our answers went from long and exuberating deliberations to short and simple responses as giving by our youngest member Rahshaun Hunt he stated a man is someone who take care of his family. However one thing we all unanimously agreed on is a man should be true in his duty to God his lord and savior. 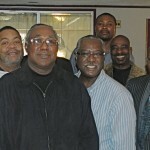 We were very please to have with us The New Pastor of Asbury AME church The Rev. 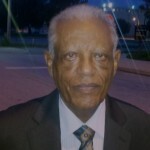 Dr. Stanley Gordon Smith Senior Pastor. 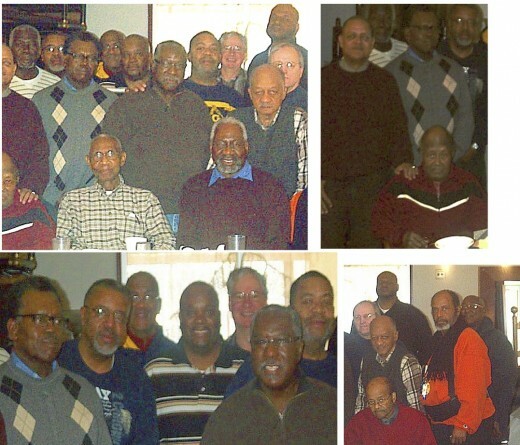 Our Discussion leader Brother Ed Fitzgerald at our May 4, 2013 breakfast forum took as his subject Mentoring Our Young Black Males he express his belief about how every man can be a mentor by simply reaching out to the kids in his families and his neighborhood. Brother Ed pointed out some of the Proven Benefits of Youth Mentoring: mentoring assist in the reduction of youth Alcohol and Drug use, Teen parentage, Gang membership and Peer violence. Other Benefits to Youth of Mentoring are it improvement our youth interpersonal skills along with Self- confidence, Attitudes toward school and Academic achievement. 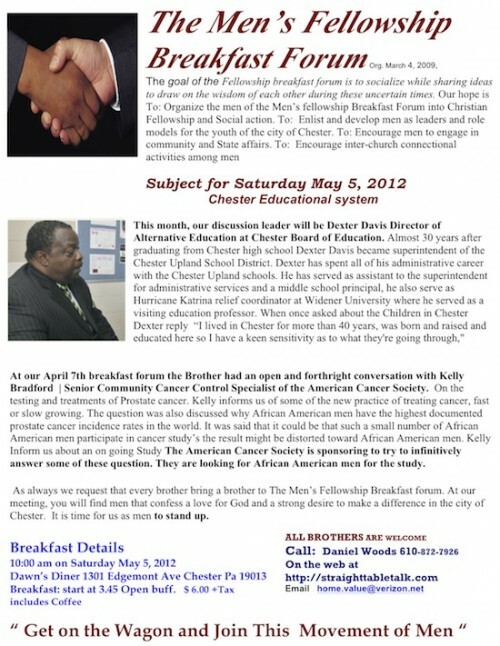 Brother recognizing how important it is for us to become mentors to our young black men: we are asking 100 men to become a mentor in the month of May and June 2013. Each year, Labor Day comes and goes on the first Monday of September, and you may find peace of mind knowing you have the working day off and your children will be returning to school soon. However, do you know the origin of Labor Day and why it is a widely celebrated holiday? Beginning in 1894, President Grover Cleveland marked the first Monday in September as Labor Day. This holiday is a dedication to the achievements of American workers. A tribute is given to workers in the form of a town parades, family entertainment, speeches, and of course, the day off. Emphasis is also placed upon the economic and civic significance of the holiday and how the American employees have promoted the nation’s strength, freedom, and leadership throughout history. We encourages the community to remember these facts as you celebrate this historic and patriotic holiday. Whether you are a business owner, employee, or entering the job market, keep in mind that hard work and dedication to your passion will lead you down a successful path. The American Dream is still possible, and you can reach it with a strong heart and will to fight for happiness. President Obama is a true symbol of the United States of America. His presidency is a living truth to every little African American boy and girl in America as well as the rest of the world, that in the USA if you prepare your self and work hard it is possible for you to be what ever you want to be. Can it be that God is telling us something with the election of President Obama? 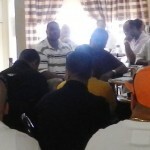 At the Men’s Fellowship Breakfast Forum on February 4, 2012 the Brother had a very lively discussion on the lack of God in the School, community and the boys on the Street. What was most alarming was the knowledge that some of our young boys do not think there is a God. 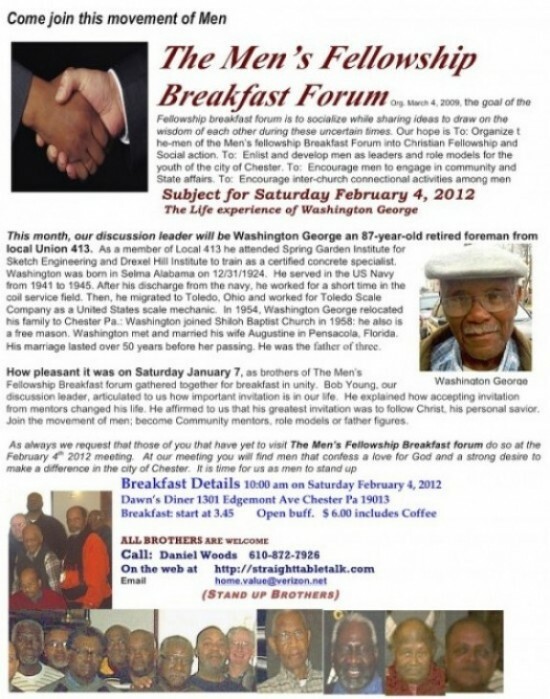 This month, our discussion leader will be Washington George an 87-year-old retired foreman from local Union 413.